It is possible to have a home with no carpets at all. In fact, there are certainly more than a few modern London flats and houses whose flooring are all marble, hardwood or tile. If your style is sleek and ultra-modern, you may be familiar with a home that is free of carpeting. But truth be told, the majority of London dwellings have at least one carpet in them. Carpet cleaning is a difficult task and requires more than just a quick run of the hoover. If you truly want your carpets to be clean and disinfected, there’s only one way to get them that way – call Gutter Cleaning on 020 3397 8284. For the great low rates that we offer, you’ll find that our competence when it comes to carpet cleaning far surpasses that of other London cleaning companies. Moreover, we use only the safest and gentlest of cleaning products to ensure that there are no hazards to your family and pets and that no damage will be done to your carpeting. Whether you live in a rented flat or own your own home, chances are you have carpets. And chances are you have no idea how dirty they actually are. There are many reasons for having carpeting in the home, especially if you are in a flat where there are many other tenants above and below. Carpeting can be a pretty good dampener when it comes to noise. Just think of a pair of high heels or men’s dress shoes tapping on the hardwood floor above your head. Now image that same couple dancing on a carpet; it’s a much quieter picture. But carpets can also drown out the sounds of babies crying, the television thundering during an action film and even regular conversation in a thin-walled and thin-floored building. Unless you are on the top floor, you have probably heard your upstairs neighbours at some point or another and maybe you’ve wished they had carpeting like yours. Carpeting can also be safer if you have a baby, especially one who is learning to crawl or walk. Babies do not have far to fall if they topple over sideways, but before they learn how to put their hands out to protect themselves, carpeting can mean the difference between a serious bump on the head and a mere stumble as they get up to try again. But with babies and small children and pets there comes dirt. You may not notice how many crumbs get dropped from the table until you see your child crawling his way from one side of the room to another, picking them up intentionally (or not) along the way. And as for pet hair, there are a few breeds that don’t shed, but very few dogs can take their shoes off at the door so as not to track in mud and dirt from outside. Have we convinced you that even clean carpets are dirty? We hope so because keeping your carpets clean is not only difficult work, it is important for the health of your family. Even if you do not have small children, babies or pets, your carpets are likely full of dust. 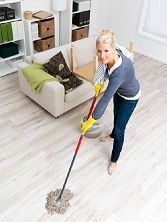 This is no fault of your own – dust is a fact of life and the makeup of carpets simply attracts the particles. Once they’re lodged between the carpet fibres, it is difficult to get them out, even with those leased carpet cleaning machines from the local Tesco. To really get your carpets clean, you need professional carpet cleaning at least a couple of times per year. Once a month is preferable, of course, if you are an allergy sufferer or have kids. There is simply no way of keeping London dust and dirt out of your carpets, unless you never leave the house and never let anyone through the door. As cleaning services go, they don't get much better than those provide by Cleaning Services. Copyright © 2013 - 2017 Gutter Cleaning. All rights reserved.